Encontro anual de carros americanos a realizar em Faro, Portugal. Annual meeting of American cars to be held in Faro, Portugal. Algarve and August are two words that combine with confusion, mixture of cultures and warmth, of course. 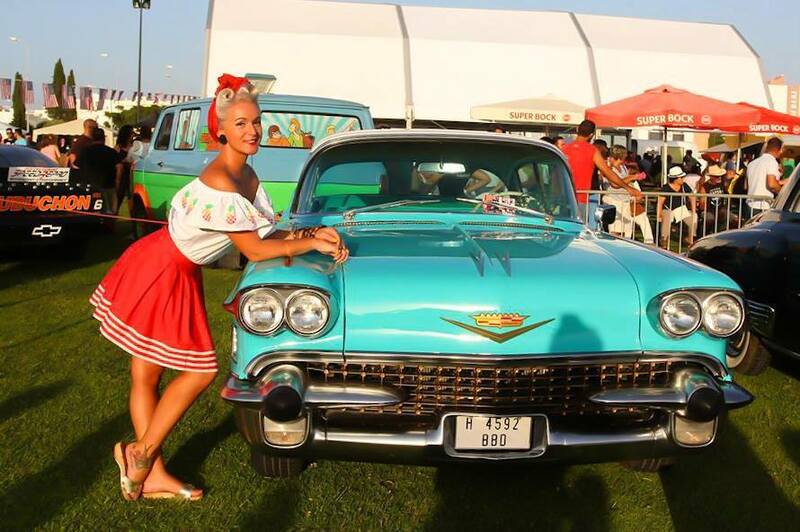 But for 8 years it also means "Americancars Algarve", an event that can take tourists from the beaches and show a little of American culture. An event where in addition to the Pin ups, rock n roll music, American motorcycles, bicycles choppers, American crafts, stand out the common vehicles in the land of Uncle Sam that are rare in Europe. O conceito Americancars Algarve surgiu da necessidade de um grupo de aficionados da cultura americana em mostrar os conceitos de vida, formas e hábitos, moda e claro, os automóveis. Assim sendo apareceu em cena este evento que atraíu a Faro, na sua sexta edição, milhares de pessoas aos relvados junto ao Fórum Algarve. Durante dois dias, mais que a capital de distrito, Faro foi a capital do culto americano, onde não faltaram automóveis, motas, camiões e comida alusiva ao continente do outro lado do Atlântico, como também desfiles de moda onde foi eleita a melhor pin-up presente, concertos de música country e rock n roll, e várias tendas de artesanato, tatuagens e brindes sempre com a temática da Terra do Tio Sam presente. The Americancars Algarve concept arose from the need for a group of American culture aficionados to showcase the concepts of life, forms and habits, fashion and of course, automobiles. Thus appeared on the scene this event that attracted to Faro, in its sixth edition, thousands of people on the lawn next to the Forum Algarve. For two days, more than the district capital, Faro was the capital of the American cult, where cars, motorcycles, trucks and food allusive to the continent on the other side of the Atlantic were missing, as well as fashion shows where the best pin- up gift, country music concerts and rock n roll, and various tents of crafts, tattoos and gifts always with the Uncle Sam Earth theme present. Agosto é mês de férias, de dias passados na praia, a corar ao sol e a ganhar uma cor que nos fará lembrar dos bons dias de descanso ao longo do ano. Contudo, nem só de praia vive a zona mais atrativa do verão em Portugal, o Algarve. Esta zona turística é muito procurada também para eventos e claro que aqueles que interessam mais são os eventos de automóveis que felizmente, lá vão decorrendo e animando a zona em plena época balnear. August is a month of vacations, of days spent on the beach, blushing in the sun and winning a color that will remind us of the good days of rest throughout the year. However, not only the beach lives the most attractive summer area in Portugal, the Algarve. This tourist area is also highly sought after for events and of course the ones that are most interesting are the car events that, fortunately, are happening there and enlivening the area in the middle of the bathing season. The variety of vehicles in the event, both in color and more or less personalized, helped to catch the attention of many who went there, on their way to the Algarve Forum or just on a weekend trip. Os nossos 42 anos de experiência no sector automobilistico fazem da Sulpeças Faro uma empresa que oferece uma vasta gama de acessórios para o seu automóvel, moto ou jipe. Garantímos a total satisfação e necessidade do cliente. O nosso gosto pelo carros americanos fez com que tenhamos começado a realizar este evento. Our 42 years of experience in the automotive sector make Sulpeças Faro a company that offers a wide range of accessories for your car, motorcycle or jeep. We guarantee total customer satisfaction and need. Our taste for American cars has made us begin to hold this event. O conceito evoluiu a partir da necessidade que a instituição “Câmara Municipal” sente em envolver os munícipes nos destinos do concelho. É importante criar uma cultura de autenticidade e paixão em volta da marca, uma cultura relacionada ao coração, mostrar que temos compromisso apenas com uma pessoa – consigo. "Lighthouse, We Evolve With You"
The concept evolved from the need that the institution "City Hall" feels in involving the citizens in the destinies of the county. It is important to create a culture of authenticity and passion around the brand, a culture related to the heart, to show that we are committed to just one person - with you. Localizado na entrada poente de Faro, a 5 minutos do Aeroporto de Faro, o Forum Algarve é um dos maiores centros comerciais da região. Com 100 lojas, 20 restaurantes, 5 salas de cinema, um hipermercado e parque de estacionamento para 2.300 veículos, é um projeto de referência que rapidamente se tornou num ponto de paragem obrigatória para milhares de consumidores locais e turistas. Located at the western entrance of Faro, 5 minutes from Faro Airport, Forum Algarve is one of the largest shopping centers in the region. With 100 stores, 20 restaurants, 5 movie theaters, a hypermarket and 2,300 car park, it is a landmark project that has quickly become a must-stop for thousands of local consumers and tourists alike.